Hello, My name is Zach and I'm located in Onalaska Wisconsin. Recieved my Tech license in 2008 and upgraded to general in 2009. I'm still learning alot about HF and really loving it. I really enjoy working anyone on HF, DX is my favorite along with 6 and 2 meters. I'm Working out of a new room for the shack in the basement of my new house, Yep its top of the line! My current equipment is a new Yaesu FT-950 accompanied with a Heil GM5 mic and a FL2100B amp for good measure, also an Icom 271A all mode 2 meter rig and a Yaesu FT-7800R for 2 meter repeater and simplex stuff in the area. In the mobile I have an Icom IC-2720H duel bander for 2 meter and 440. 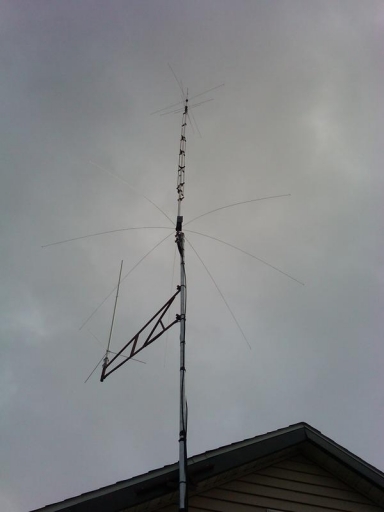 My antenna's are an AV-640 vertical at about 51 feet and a Jetstream JTB2 2m/440, also I have up an Off Center Feed Dipole with a 4 to 1 Balun and it works on all bands except 160. Hope to work you on the air someday!! I enjoy sending out QSL cards and would be happy to send you one. NO SASE REQUIRED. 100% QSL! just send me a card and I'll send one back to you. Hope to hear you on the air soon.